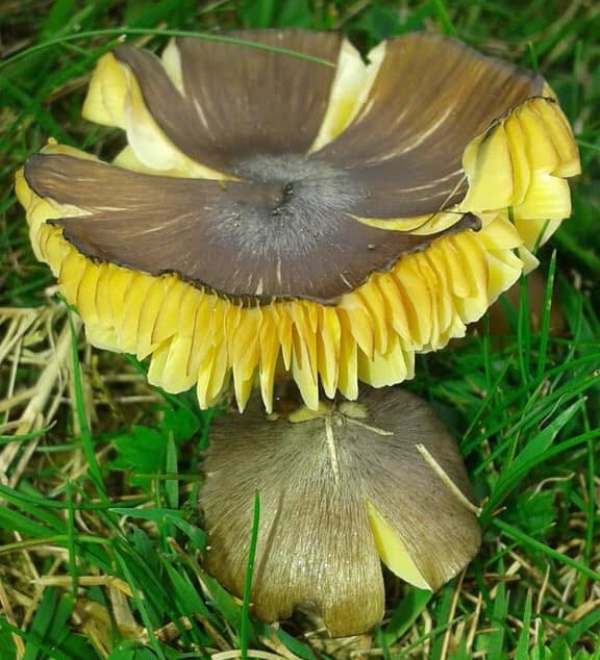 One of the Britain's rarest fungi, the Date Waxcap is immediately recognisable by its dark- to mid-brown cap and its yellow or orange gills and stem. Although it occurs throughout most of Europe, nowhere is this striking waxcap anything but a very occasional find. Although south-facing slopes on calcareous unimproved grassland are usually cited as being the best places for date Waxcaps, these hard-to-spot fungi confound us by turning up once in a while in neutral and even acid grassland. Date Waxcaps are rare in Britain, with fewer than 100 officially recorded sightings listed on the FRDBI summary. The majority of known locations are in Wales, south-west England and the Pennines, but there are occasional sigtings of the Date Waxcap as far north as central Scotland. This remarkable mushroom is also reported occasionally from some parts of mainland Europe and from Canada and the USA. Described in 1772 by Italian physician and mycologist Giovanni Antonio Scopoli, who named it Agaricus spadiceus (in a period when most of the gilled mushrooms were included initially in the genus Agaricus) the Date Waxcap was transferred to the genus Hygrocybe by Finish mycologist Petter Adolf Karsten (1834- 1917) in 1879, at which point it acquired its currently accepted scientific name Hygrocybe spadicea. Synonyms of Hygrocybe spadicea include Agaricus spadiceus Scop., and Hygrophorus spadiceus (Scop.) Fr. 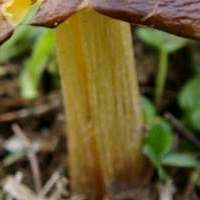 The specific epithet spadicea is Latin and means 'of a bright clear brown colour', or chestnut brown, a description which is certainly applicable to the caps most Date Waxcaps. 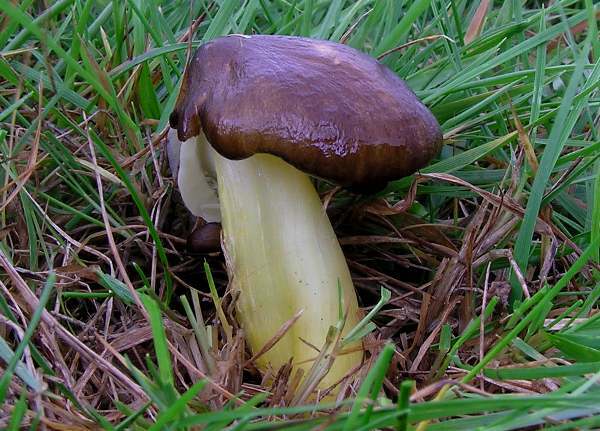 A distinctive dark brown, the caps are at first broadly conical, developing lobes and eventually expanding but retaining a fairly acute umbo; often the margin splits to reveal the pale cap flesh beneath the cap cuticle. The adnexed to free gills are moderate to widely spaced and initially yellow or occasionally pale orange, turning somewhat darker with age. Yellow or pale orange, the cylindrical stem is fibrilose and sometimes has brown longitudinal fibres; 3 to 12mm in diameter and 3.5 to 12cm tall; it has no ring. Ellipsoidal, smooth, 9-12 x 5-7µm; inamyloid. Hygrophorus hypothejus has an olivaceous-brown cap; it is a woodland species. The Date Waxcap is an extremely rare sight in Britain and Ireland, as it is also on a European scale. 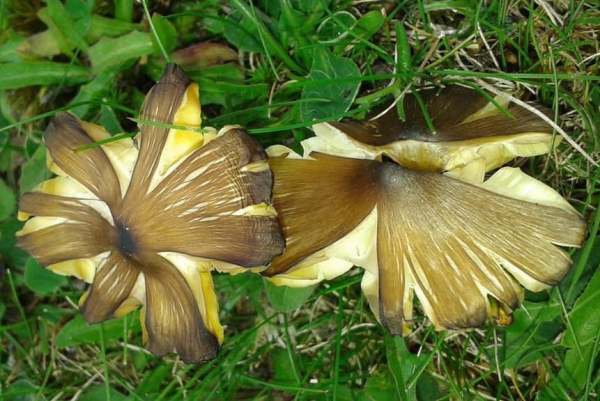 In many countries including Britain this wild mushroom is on the Red Data List, meaning that it is of such serious conservation concern that it is given legal protection from disturbance by people. 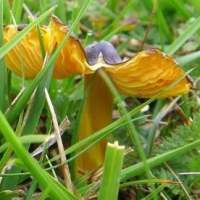 The Date Waxcap was categorised as 'Vulnerable' on Britain's Red List prepared by Bruce Ing in 1992, and in the current Red List (Evans et al 2006) it is categorised as Near Threatened. 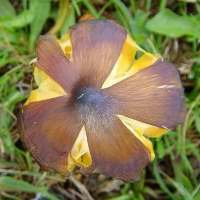 The Date Waxcap is a UK Biodiversity Action Plan (BAP) species. These wild grassland fungi are so scarce it would be not just a crime but quite unforgivable to gather them for eating. Please consider them too toxic even to touch! Dictionary of the Fungi; Paul M. Kirk, Paul F. Cannon, David W. Minter and J. A. Stalpers; CABI, 2008. This page includes pictures kindly contributed by David Harries and Kevan Parker.